Polish producer Marcin Badura AKA Beat Le Juice is holding down The Funk in Mainland Europe. By his own passion for the funky nature of life and music, Beat Le Juice parlayed a formal education in music production into the beginning of a career path. Having hit #1 on the Beatport Glitch-Hop charts and gathered support from UK-based record label Scour Records early-on, Beat Le Juice's transmissions of glitchified funk and soul have been succesfully validated by the market. 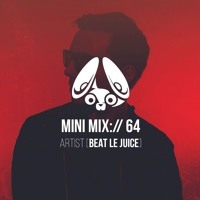 In his Stereofox Mini Mix, Beat Le Juice squashes a mash of electronic flavors together from citrusy-sunshine melodies to thick, pulpy basslines with a funky concentration and a squeeze of soul. It's not surprise that his originals mix well together with industry influencers like Krafty Kuts, GRiZ, The Funk Hunters, and more, as you'll see in the tracklist. We also got the chance to pick the brain of Mr. Beat Le Juice in an interview with questions about music to more fun things in life, so read on to discover more about the up-and-coming European producer. You can also stream it on YouTube here. Yo, Marcin! Happy to have you on this mix. Tell us more about yourself, man. My pleasure, thanks for having me! I'm a future funk/ glitch hop music producer from Poland. I was living and studying music production in Manchester for over two years but last year I decided it was a good time to go back to my hometown of Katowice and continue to make noises there. I recently dropped my debut EP on UK based label „Scour Records”. It's made its way onto #1 at Junodownload's Beatport chart and #1 Beatport's Glitch Hop chart so I'm very happy about all this. Your latest EP So Much Style has some dope track titles to fit the music. Any cool stories behind the tracks? Cheers man. There's no particular stories behind the track titles, but the “I Promise” one is kind of special to me. It expresses my love to funk music and putting this out as a first track on my debut album is a symbolic for me in a way. I treat it a promise that whatever I am going to put out in the future has to be funky. What kind of hardware and software are you using to produce? I use a fairly simple setup, consisting of Ableton Live 9 which is my DAW of choice, an Arturia MIDI keyboard and a pair of Adam A7X studio monitors. There are few VST instruments that I use repeatedly, these are Serum, Massive and Lounge Lizard. For mixing purposes my go to tools are iZotope Music Production Bundle and few Soundtoys plugins. I also own a Mininova synthesizer but I use it mostly with my talkbox and I have yet to include in my tracks. Tell us about some notable things in life that feed your creativity and how you put that into your music. I guess I tend to be inspired mostly by the pure process of making music. I don't wait for the inspiration to strike me but instead I'm trying to work on music nearly every day to be able to capitilize on experimentation and happy accidents that occur during the studio sessions. I sometimes tend to render out the song I'm working on to see how I react to it in different environments. I like to put it on headphones and take a walk, play it my car or try some dance moves to it. It can give me a different perspective of what the track needs to be better. You mentioned that you want to get into the live circuit. What kind of equipment will your live show consist of? This is still in the planning stage, but I am sure the core of my setup is going to be Ableton that is going to be controlled with a handful of midi controllers including Push and possibly APC 40. On top of that I want to have a few things that I can keep myself busy with. I'm definitely going to include my old but good Numark TTX turntable for scratching and possibly my Mininova synthesizer for a live talkbox or vocoder use. You mentioned in an interview that you draw musical inspiration from pioneers like James Brown to modern wizards of electronic funky beats like K+Lab and GRiZ. Who would you collab with if you could choose? Anyone past or present. Aw man, there's so many great people I'd like to work with. It'd be a dream to get into studio with Prince and Roger Troutman just to be able to witness their sheer musicianship and get inspired by their work ethic. If you could play at any festival in the world, which one would you choose and why? Definitely Shambhala. Line up is amazing every year and it would be a fantastic opportunity to meet in person all the guys involved in the glitch hop scene. Plus I would love to visit Canada one day. From what I've seen, the surrounding of this festival is just mesmerizing. What kinds of things do you get into when you’re not writing music? I love dancing. I was an avid popping dancer back in the days and I'm slowly getting back to it. It's my second best thing of experiencing funk besides making music and my favourite form of a physical activity. I also enjoy cooking, especially for my wife. What’s the next move for Beat Le Juice? Write more music, challenge myself more with the next release. I definitely want to get into playing live. I feel the need of leaving my cosy studio environment and play my music out in the outside world. I need to leave my comfort zone again to be able to go back to studio with new and fresh ideas. Compare yourself to who you were yesterday, not to who someone else is today. Do you and don't obsess over not being in the same place as someone else is. You don't know their full story but you know yours. As long as you're making progress and getting better by even a tiny bit every day, you should be on your right way.